Dragon Quest IV: Chapters of the Chosen (ドラゴンクエストIV 導かれし者たち, Doragon Kuesuto Fō Michibikareshi Monotachi?, lit. 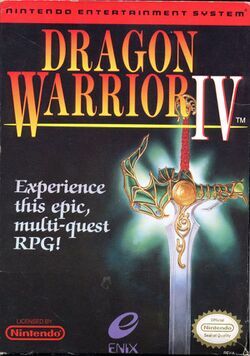 "Dragon Quest IV: The Guided Ones"), known as Dragon Quest: The Chapters of the Chosen in Europe and originally published as Dragon Warrior IV for the North American NES version, is a console role-playing game and the fourth installment of the Dragon Quest video game series developed by Chunsoft and published by Enix (now Square Enix). The game was remade by Heartbeat for the PlayStation, which eventually was available as a Square Enix Ultimate Hits title. Dragon Quest IV differed from the series by breaking up the game into five distinct chapters. The first four are told from the perspective of the Hero's future companions and the fifth one, from the hero's perspective, brings all the characters together as they begin their journey to save the world. Cover art for the Nintendo DS version. Cover art for the Japanese PlayStation version. Cover art for the Japanese Famicom version.